The Indian Ocean is the third largest of the world's oceanic divisions, covering approximately 20% of the water on the Earth's surface. It is bounded by Asia—includingIndia, after which the ocean is named—on the north, on the west by Africa, on the east by Australia, and on the south by the Southern Ocean (or, depending on definition, by Antarctica). As one component of the World Ocean, the Indian Ocean is delineated from the Atlantic Ocean by the 20° east meridian running south from Cape Agulhas, and from thePacific Ocean by the meridian of 146°55' east. The northernmost extent of the Indian Ocean is approximately 30° north in the Persian Gulf. The ocean is nearly 10,000 km (6,200 mi) wide at the southern tips of Africa and Australia, and its area is 73,556,000 km² (28,350,000 mi²), including the Red Sea and the Persian Gulf. 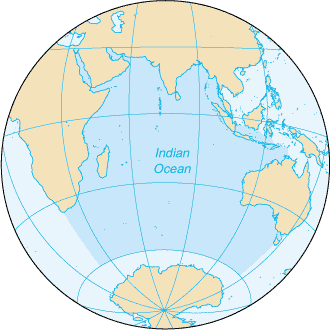 The Indian Ocean's volume is estimated to be 292,131,000 km³ (70,086,000 mi³). Small islands dot the continental rims. Island nations within the ocean are Madagascar(the world's fourth largest island), Comoros, Seychelles, Maldives, Mauritius, and Sri Lanka. The archipelago of Indonesia borders the ocean on the east.